Not mine. Looks pretty nice. Daily driver is currently a 2010 Jeep Wrangler that I've modified. Very fair price, considering Ural sidecars by themselves are ranging around $3,000 right now (and this looks like a nice one). Looks like it has a solid sub-frame for the sidecar, and it has the big 6-gallon tank on it. Not interested in selling the bike without the side car but am open to selling just the side car. Quite reasonable considering people seem to think these airheads are worth $6k on their own. 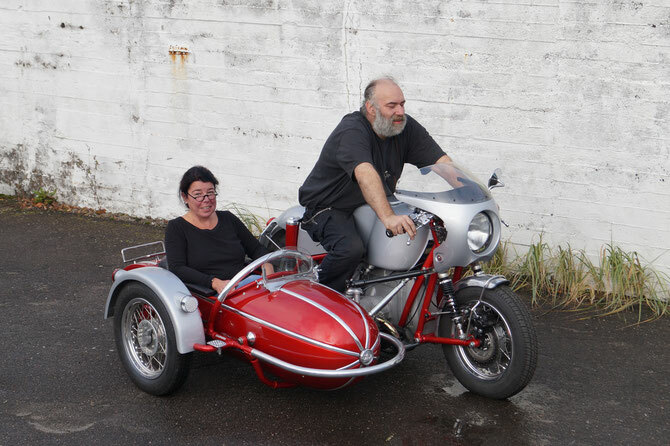 $3k for just a sidecar would be pretty steep. I’d at least expect a running 650 attached to it for that price. It is so nice to finally see a "BMW" and sidecar which REALLY is a BMW with sidecar. Thanks, it sure is pretty. $3k for just a sidecar would be pretty steep. Lew lives in California, Kris. There's probably a bike-less hack tax. Very nice. The bike with that larger tank is probably worth what the asking price is for the whole rig, In good to great shape $5000 to $6000. /5's are getting pretty collectable and he states he still has all the stuff to make it a solo again. Interesting that he won't sell the bike without the sidecar but will sell the sidecar without the bike? Anyway, a good deal. No reverse of course but lots of other stuff that's superior. Second year of the /5 models. Pretty sure a /5 would be toast (pun intended) after having a chair lashed to it for any period of time (even with a proper sub-frame). That old two-piece bolt-together frame would probably take a "set". I was headed that way and decided I just couldn't do it to the old man. A proper sub frame would only be attached to the main frame and would connect 5 points of the bike´s right side frame to left side. 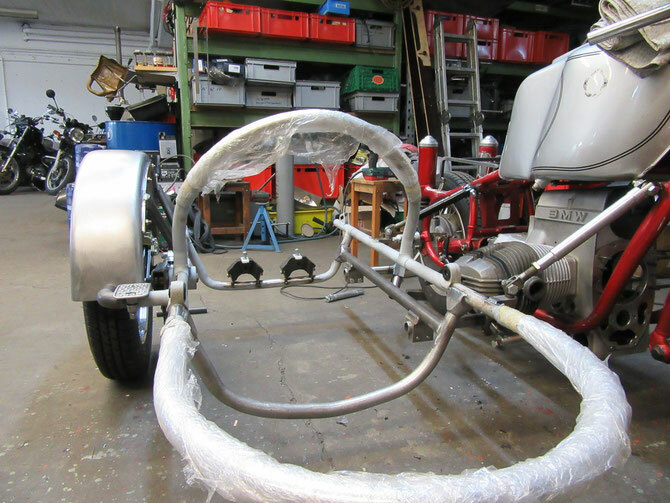 Pulling a sidecar for a longer period of time could affect the main frame, you´re totally right. That depends on how the rig was used. But in my personal opinion it would not ruin the bike´s frame inevitably. Would I personally hang a sidecar to a well maintained and mint condition /5? No. Would I do that to a regular used R100R? Definitely . One of the best bikes for that purpose. Again, regarding what the sidecar is worth and similar to that other "vintage" rig in another thread, it's what someone is willing to pay. There is an HD factory sidecar with frame for sale on Fleabay right now for $8000.00. I just paid $80.00 for a pair of old used OEM passenger pegs for my 1991xr250L. According to Honda they went for $30.00 for the pair new. But they are delisted/not made anymore so my only option was to wait and buy used when and if they came up from a bike teardown of salvage yard that advertises. That's a beautiful "toaster" LMO. I reckon, that´s not too far away from the prices in U.S.
A seller might get lucky once, but on average I would bet the selling price of a used Ural chair is closer to $1500 than to $3000. There HAVE been a couple in the last year. One, down in Los Angeles, was priced at $400... I'm an idiot for not pouncing on it, but that's a 500 mile round trip. My R75/5 is a late build '73. Long Wheel Base with extended swing arm, and extended seat pan. Vielleicht... But I don't think I would convert back to solo. The weak /5 telescopic forks are a notorious problem, even without the added torque loads created by asymmetric loading caused by sidecar. If the fork tubes are not 'perfectly' parallel the fork sliders stick, a lot. Even with a "brace" installed. The /5 and /6 were/are rubber chickens.... mine is a daily rider. Although my black Retro Classic is a pretty good alternative. My BMW dream tug ... /2 (1000cc) to Ural conversion. These rigs are cool! I built that for a customer recently, not with a Ural but with a reignforced Steib sidecar with a homemade sidecar swingarm and disc brake on it.